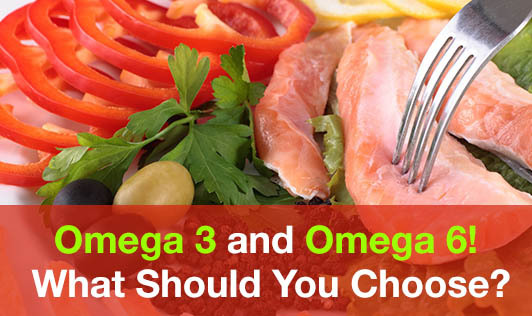 Omega 3 and Omega 6! What Should You Choose? Omega 3 fatty acids are a class of essential poly - unsaturated fatty acids, necessary for human health. As the body cannot make them, you can obtain omega 3 fatty acid from sardines, salmon, tuna, flax seeds, walnuts and spinach. Reduces inflammation throughout your body and helps in conditions like rheumatoid and osteoarthritis, and premenstrual symptoms.? Keeps your blood from clotting excessively.? Helps prevent the growth of cancer cells.? Lowers the amount of lipids (fats such as cholesterol and triglycerides) circulating in the bloodstream? Helps to prevent the symptoms of depression and attention deficit hyperactive disorder. Omega-6 fatty acids are another class of essential poly - unsaturated fats found in vegetable oils, nuts and seeds. When eaten in moderation and as a substitute for saturated fats found in meats and dairy products, omega-6 fatty acids can actually be good for your heart and brain. Dietary sources of omega-6 fatty acids include safflower oil, sunflower oil, soybean and corn oil, eggs, avocado, etc. Some studies show that taking gamma linolenic acid (GLA) for 6 months or more may reduce symptoms of nerve pain in people with diabetic neuropathy.? Stimulates skin and hair growth.? Maintains a healthy reproductive system and bone health.? It is always important to strike a balance between the levels of omega-3 and omega-6 fatty acids in our body, through the diet in the ratio of 1:1. By doing so, they work together to promote good health, especially that of the heart and brain. The unhealthy ratio of Omega-6/Omega-3 in the diet is associated with heart attacks, arthritis, osteoporosis, inflammation, mood disorders, and cancer.